As a model in the fashion industry, I’ve gotten the opportunity to work with some amazing makeup artists over the last several years. Charlotte Tilbury is one of the greats- from backstage at shows to on set at editorial shoots, her passion and skill really shine through. I was so excited when she came out with her own line of products, many of which she had been developing for years! Us models were lucky enough to get a sneak peek at some of those products during fashion week. Charlotte’s Magic Cream was one of of her biggest hits, and I just couldn’t wait to get my hands on a jar once it was officially released. Just look how fluffy and cloud-like it is! This baby is loaded with patented hydrating and youth-boosting ingredients that magically transform the look of tired, dull skin. In-demand hyaluronic acid provides ample moisture, while rosehip oil, camelia oil & vitamin E promote youthful, glowing skin. Fine lines and wrinkles don’t stand a chance thanks to the fancy-sounding BioNymph Peptide Complex, which supports natural collagen production and cell energy while fighting those pesky free radicals. I love to slather on a thick layer post cleanser and serum- it’s so soft and supple! Even better is that it’s free of harsh, irritating ingredients like sodium laureth sulfate and parabens, making it great for those with sensitive skin. If you’re in the market for a high quality dream cream, I highly recommend checking out the Magic Cream stat. Allow me to let you in on a recent skincare trend I’ve been loving. Skincare boosters! Boosters have been gaining popularity lately, and for good reason. Simply put, they’re high-powered formulas of concentrated ingredients that amplify improvements in your skin, so you get the results you want, only quicker! Paula’s Choice has created eight powerhouse boosters, each targeting a specific skincare concern, that can be used alone or combined with your favorite serum or moisturizer to give it that extra potency. I like that Paula’s Choice chooses to use only ingredients backed by research for the exact concerns each booster is designed to address. That way you know you’re getting a truly effective product! I’ve been trying out a few of the boosters recently, and can honestly say I’m impressed. Their lightweight textures make them ideal to layer with my other products, and be on my way! Starting with a tried and true favorite, the Hyaluronic Acid Booster targets parched skin, fine lines, and lack of suppleness with ease, leaving you with soft, plump skin. If you struggle with red or brown marks, dull skin, or fine lines, the C15 Super Booster could be for you! The 15% ascorbic acid is combined with vitamin E & ferulic acid (like cult-fave SkinCeuticals C E Ferulic) to give you an all-over translucent glow. Vitamin B3 is having a bit of a moment lately, thanks to its ability to help visibly reduce the appearance of large pores and uneven skin tone. The 10% Niacinamide Booster is combined with additional antioxidants to deliver key anti-aging benefits. Winning! For those with blemish-prone skin, the 10% Azelaic Acid Booster is where it’s at. It’s been such a great alternative to the typical salicylic acid products- I really notice a difference! 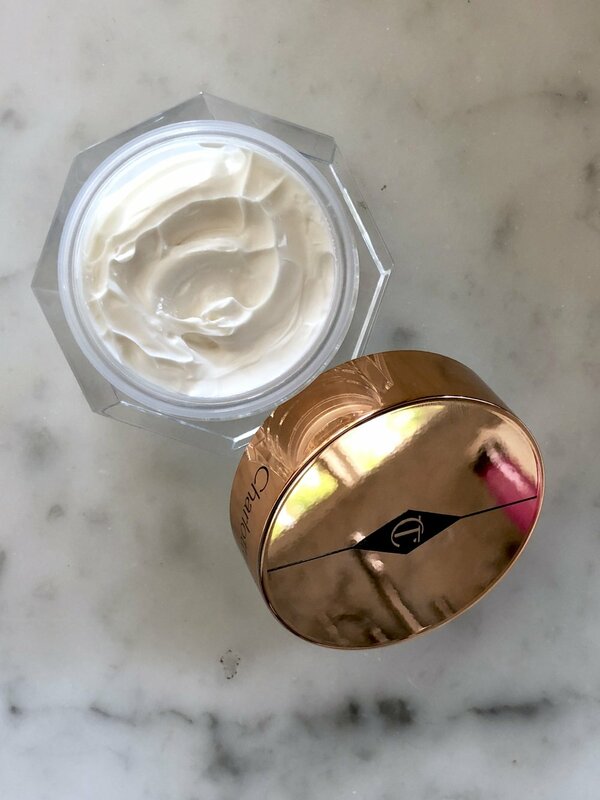 I’m also looking forward to trying out the 1% Retinol Booster post-pregnancy, as this multi-tasker fights advanced signs of aging as well as pesky blemishes! Next on my list is the C25 Super Booster (great for spot treating stubborn discoloration) and the Peptide Booster (with a hydrating amino acid complex). Which are you most curious to try? Welcome back to Get Fit with Britt! I'm going to be posting some demos of my fave exercises taught at my new local barre studio, Bar Method Silver Lake, with the help of their awesome instructors. The Bar Method is a fast, effective, and most importantly, safe way to change your body, and follows a technique that's high-intensity, but low impact to protect your joints! Thanks to barre classes, I have been able to build long, lean (not bulky!) muscles while tapering everything in & lifting it up! For this series, we will pick a particular move, explain the focus area and correct form, then demonstrate it so you can practice at home! That way, if/when you come to the studio yourself, you'll be rocking the moves & way ahead of the game ;) These exercises are also a great way to get fit on-the-go! I find myself regularly using barre exercises during my hotel room workouts. Additionally, you can get the outfit I'm wearing at the Bar Method Silver Lake studio, so definitely go by if you're looking for some fun, new workout gear! Come & join me, get that healthy & strong body you've always wanted- come Get Fit with Britt! Today's exercise focuses on abs, specifically that abdominal exercises that are pregnancy safe! It’s important to keep a strong core during pregnancy, as this can help in labor and delivery, as well as quicken your recovery time. However, some positions aren’t safe for you or baby as your bump grows. This is a modification for low curl with your feet down. By adding 3-4 risers (or use something like this, or even a few pillows) for extra support, you’re really able to take the pressure off of your lower back. Be sure to keep your abs pulled in (navel to spine!) and hips tucked under, and most importantly- don’t forget to breathe! Even if you don’t take the challenge options (arms forward and curling forward), as long as you’re breathing, this exercise is super effective. Deep breaths help me keep focused, and allow me to really target my deep core! Do three sets of twenty exhales either holding on, extending your arms forward, or adding a small curl to match your breath. PS- Here’s a link to the Bar Method blog for some extra prenatal barre tips! If you have sensitive skin and have trouble finding products that actually work, but also don’t irritate your skin, I have just the stuff for you! 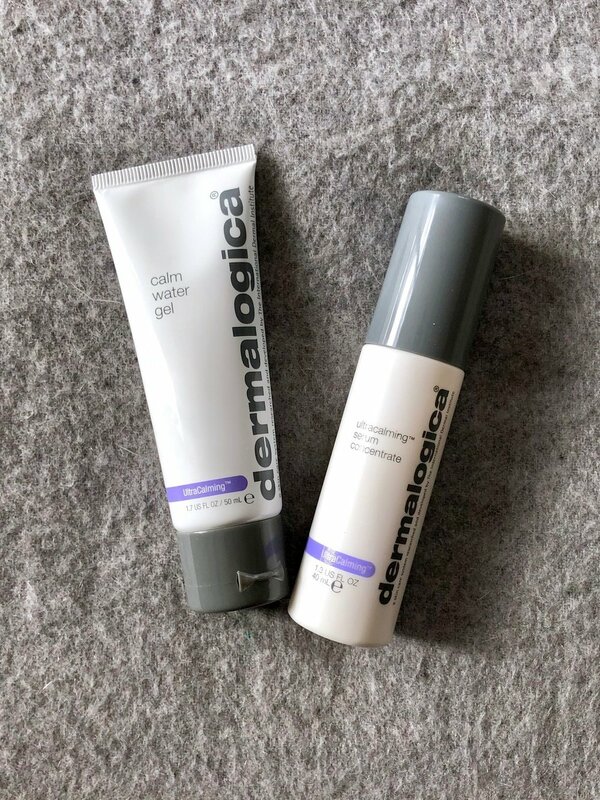 Dermalogica makes some killer products- I’ve been a fan of their vitamin C serum for a while now- but they also make a line of UltraCalming products that is specifically catered to those with sensitive skin like mine! Using their exclusive UltraCalming complex, which contains soothing ingredients like oat, botanicals, peptides, evening primrose oil, as well as sunflower seed & avocado extracts, these products aid in easing sensitization and defending against future problems. The UltraCalming Serum Concentrate has been a true god-send. This powerhouse serum works to calm and soothe sensitive skin (especially after any non-invasive facial treatments), and helps interrupt the inflammatory triggers that cause flare-ups to begin with. I like applying a thin layer over my entire face post-cleansing, then following with the UltraCalming Calm Water Gel. This water-gel moisturizer feels practically weightless, yet still adequately hydrates and moisturizes my skin. Thanks to apple fruit extract, cactus pear extract, and glycerin, this skin-quenching fluid is able to support a healthy moisture balance while defending against dryness. And dual hyaluronic acid technology works to increase and lock in moisture throughout multiple layers of the skin’s surface! Yes please! I was also more recently introduced to their newest addition, the UltraCalming Redness Relief Essence, which is the perfect combo of toner and serum. It’s lightweight enough to feel super refreshing, yet concentrated enough to visibly reduce redness and sensitivity. Apply it post-cleanser, right before your UltraCalming Serum Concentrate. I’m curious if you’ve tried out any other products from the line? I’m debating which one to try next! Maybe the cleanser? Let me know! I'm back with more Tata Harper goodies, and his time, it's all about the body! With all the attention given to the skin on your face these days, it's easy to forget about pampering your body. Regular exfoliation and hydration are key, so you can keep those limbs baby soft! 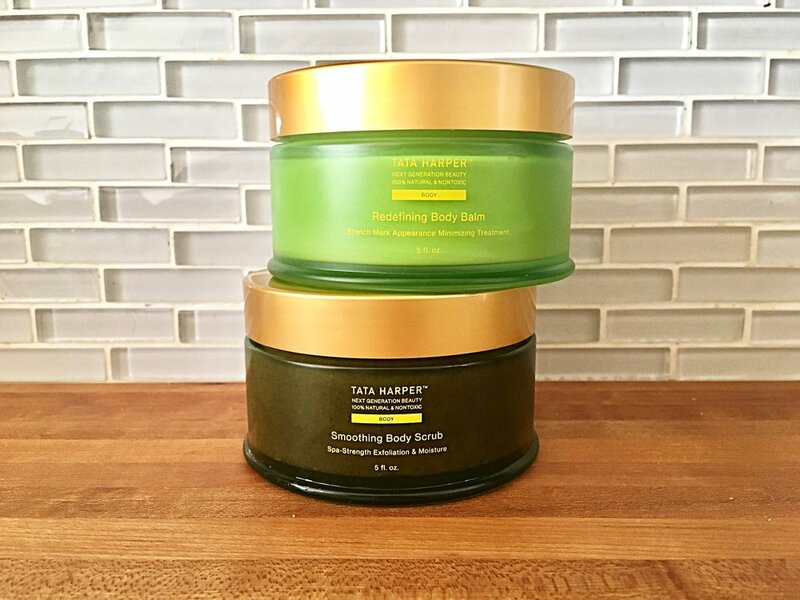 I like to keep my Tata Harper Smoothing Body Scrub in the shower for a totally spa-like exfoliation treatment while I cleanse. It's strong but gentle, and helps to fight dull, uneven, and rough skin using Tata's special biodegradable multi-particle polishing complex. It's sure to leave your skin super smooth and glowing! PS- try it out before shaving to help open up the root and soften your hair too! I’m all about a super-concentrated, highly potent serum or cream. You know the ones. They’re packed full of multi-tasking, powerhouse ingredients that promote youthful, radiant skin and give you that glow you crave. I’m happy to say that Perricone MD Cold Plasma+ Face Serum and Eye Cream do exactly that, plus more. They use a proprietary liquid crystal (fancy!) delivery system for faster and deeper penetration of ingredients. Practically any skin issue, like loss of radiance, uneven texture or tone, discoloration, redness, enlarged pores, fine lines, wrinkles, or loss of firmness, can be vastly improved with these babies. I love that the face serum is super smooth and creamy (feels like a finishing cream! ), but the concentrated formula gets to to work quickly boasting all its anti-aging benefits. Copper tripeptides, vitamin C ester (the highly stable, easily absorbable form of antioxidant-rich vitamin C), and omegas 3, 6, and 9 come together to work their magic here, and the proof is in results. My skin has been feeling super plump and baby soft. Really so, so supple! The eye cream uses the same ingredients, but also targets the appearance of dark circles, puffiness, and crow’s feet! Both Perricone MD products are fragrance free, making them perfect for those with sensitive skin like mine. A little goes a long way, so although the price is steep, each jar should last you quite a while. Let me know if you end up trying them out- you won’t be disappointed! * Some of my posts may contain affiliate links. If you buy something through one of these links, it won’t cost you a penny more, but I’ll earn a small commission. This allows me to continue to generate content for you, and helps keep the site up and running. Thanks for your support!